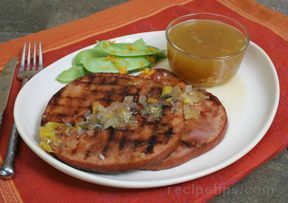 A country ham has a bold, intense flavor you won't get from a more typical type of ham. 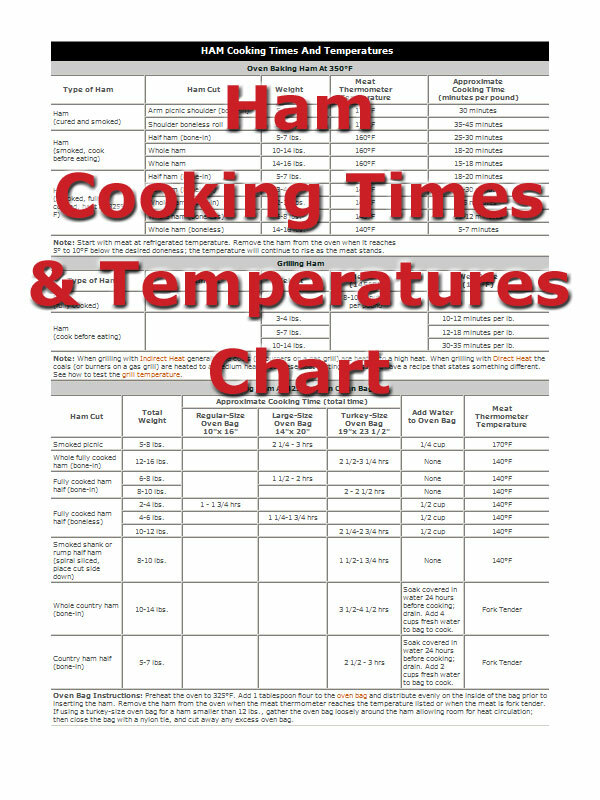 You can find detailed preparation and cooking instructions for an old-fashioned country ham. 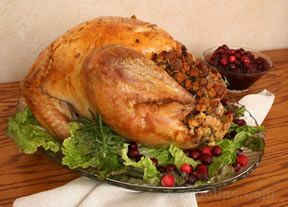 Begin preparation two days before cooking. 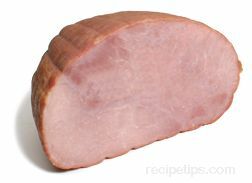 Most dry-cured hams have some mold that has formed on the outer surface during the curing and drying process. 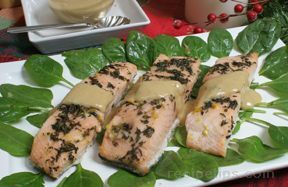 This mold is not harmful, but should be removed before cooking. 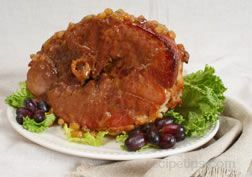 To remove the mold from the surface of the ham, wash the ham in warm water and use a stiff scrub brush to remove it. After scrubbing, rinse well with water. 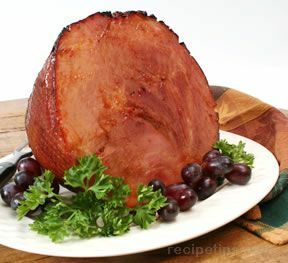 Once the mold has been removed, place the ham in a pot large enough to cover the ham with water. 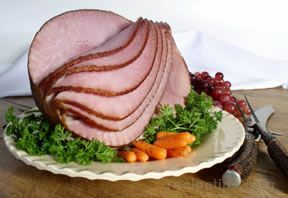 Fill the pot with cold water so the ham is covered and let stand at room temperature. 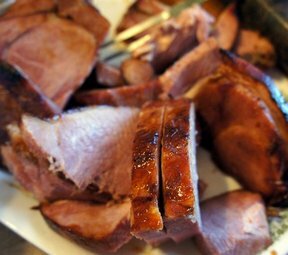 If salt crystals appear on the ham, the water should be changed every 4 to 6 hours, and the ham can be soaked for up to 72 hours. If salt crystals do not appear, only change every 6 to 10 hours and soak up to 12 hours. 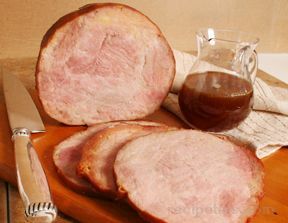 Soaking reduces the saltiness of the ham, so it is important to plan for this step in preparing a country ham. 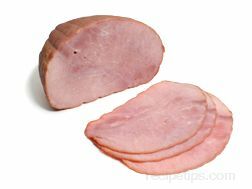 Even after soaking, a country ham will be saltier than the wet-cured hams that are generally purchased in your local food stores. 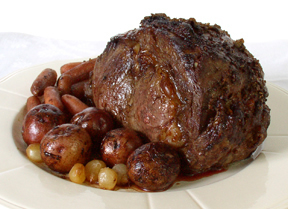 Preheat oven to 325 degrees F. An oven-cooking bag will provide more even cooking and shorten the cooking time. Add the flour to the oven-cooking bag and shake in the bag to spread it around. The flour helps prevent the bag from bursting while cooking. Place the ham in the bag skin side up. 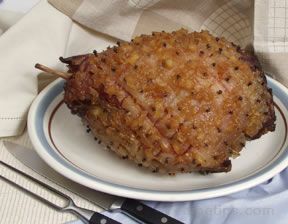 Place the ham and bag in a large roasting pan at least 2" deep. Add apple juice to the bag and close the bag securely with the nylon tie provided with the bag. 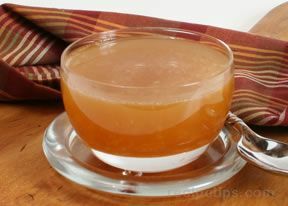 Water, other fruit juices, wine, or carbonated soda can be used in place of the apple juice. 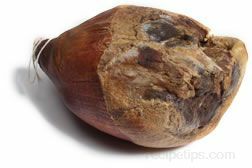 After the bag is tied securely, trim the tied end approximately 1" from the tie. The bag should not touch the top or sides of the oven. Make six 1/2" slits in the top of the bag to allow steam to escape. 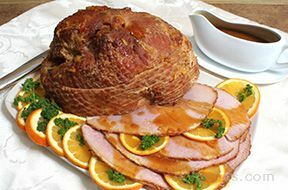 Place the ham in the preheated oven and cook for 20 to 25 minutes per pound or until the internal temperature reaches 155Â°F. To keep the bag from melting, be sure the cooking bag is not touching the top or sides of the oven. 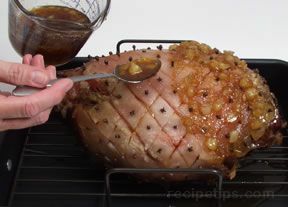 When ham is done, remove it from the bag and discard drippings. Allow ham to stand for 15 minutes. 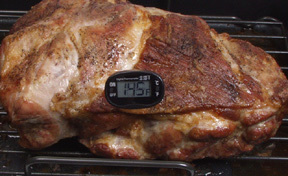 The internal temperature of the ham should reach 160Â°F during this period. 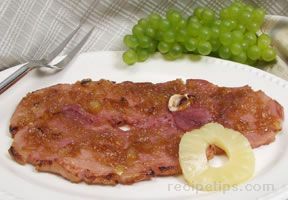 Remove skin and most of the fat, leaving a 1/4-inch layer of on the ham. 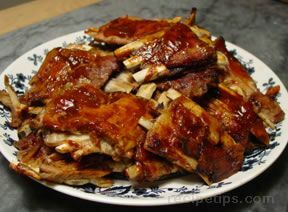 Increase the oven temperature to 375 degrees F. Score the fat by making diagonal cuts in one direction approximately 3/4 inch apart. Then make diagonal cuts in the opposite direction to form a diamond pattern. 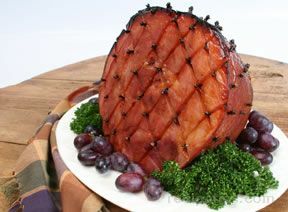 Insert a clove in each of the diamond shapes cut in the ham. 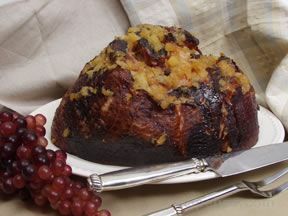 Make the glaze by adding brown sugar and pineapple (slightly drained) together and stir until well mixed. 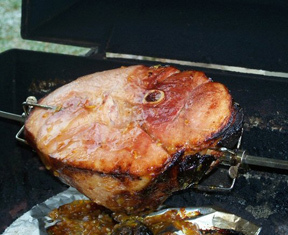 Spoon or brush glaze over the ham. 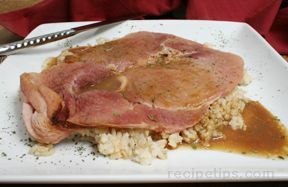 Return the ham to the oven and bake for an additional 30 minutes. Watch carefully because the glaze can burn easily. 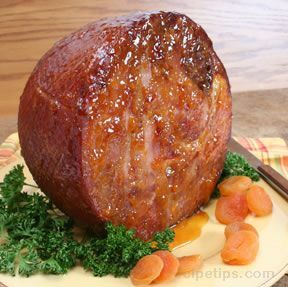 Ham is done when the glaze has caramelized and turned golden brown. Remove from the oven and carve.